In a lateral transaction, the impact on average revenue per hour has limited meaning. In other words, it is highly unlikely that the current partners are going to raise or lower their billing rates as a result of a new lateral admission. An opportunity cost likely exists if a lateral transaction employs all of the firm's current excess capacity or available capital. The impact on the average rate per hour only becomes relevant when it directly or indirectly impacts current revenue streams. Considering the effect of sharing timekeepers among practice areas with materially different rates is more relevant to lateral transactions. As an example, assume that the partner in charge of the proposed insurance defense lateral group indicates that her group needs 200 additional hours of senior associate help. Time to get excited right? She has not even joined the firm, and we are already growing. Our sample firm's managing partner decides to review timekeeper workloads and concludes that Associate 3 has the capacity and otherwise meets the capability requirements to satisfy the request from the insurance defense partner. All hours are not the same. All seems perfect so why progress with any additional analysis? Our answer is that all hours are not the same and sharing perceived excess capacity at a lower price result may lead to several unintended consequences. 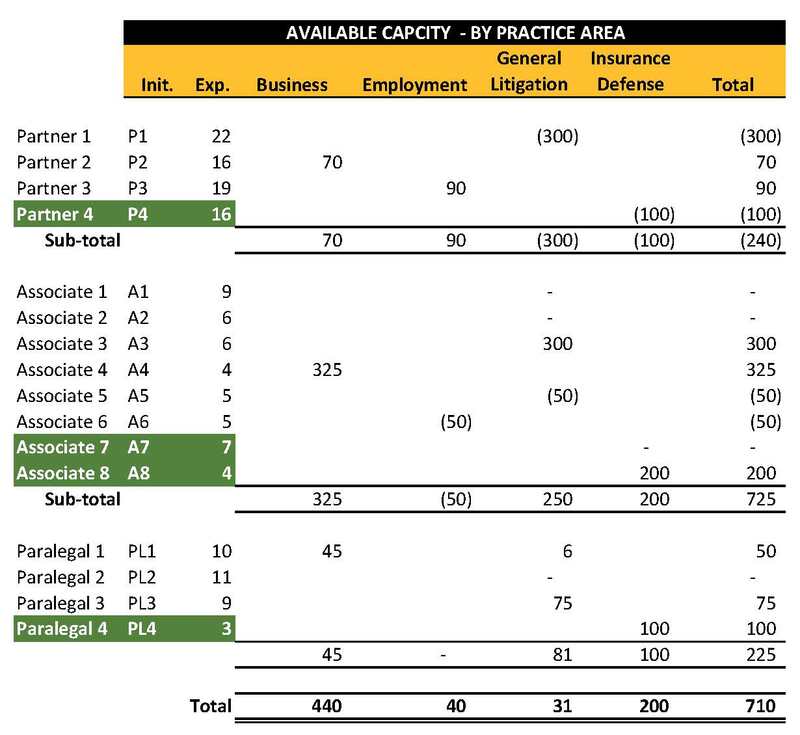 Available billable capacity by practice area. To see how these processes work in practice, let’s apply them to our sample data set. Recall that the current opportunity is to add in an insurance defense practice consisting of a partner, two associates and a paralegal. Collectively, this group produces $1.2 million +- in revenue from 7,700 billable hours. Partner hourly billing rates are $195, and associate rates are $165. Here is a recap of our post lateral firm. We begin the evaluation process by reviewing the following sample capacity analysis. In this analysis, we are comparing billable hour levels by timekeeper to a balanced level of billable hours, which we refer to as capacity. Capacity can differ by experience, practice area, other time commitments (management, marketing, training, CLE, etc.). We have previously written about capacity planning and here is a link to a useful infographic. 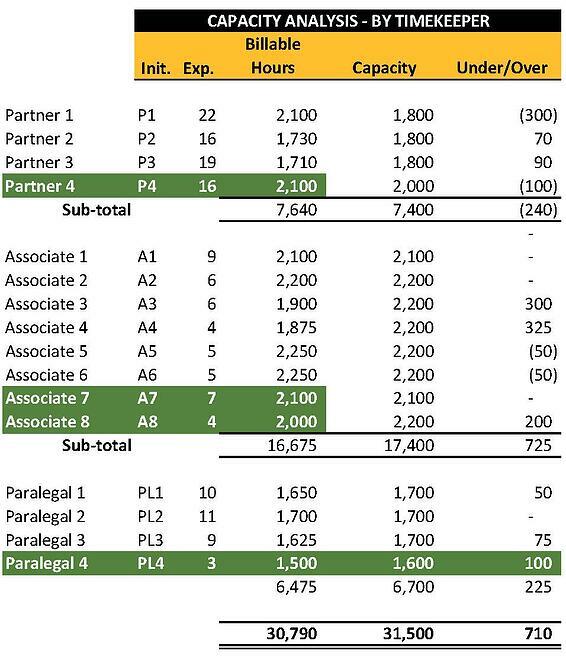 Our sample capacity analysis, which includes the new insurance defense section, shows that P1 and P4 are working beyond capacity and that A3, A5, and A8 all have significant time available. Further, as thought by the managing partner, A3 has enough experience and available time to meet the support needs of the new section. At this point, it is useful to compute the revenue benefit to the firm of this additional production. The following workload recap of A3's time indicates the incremental income and impact on average hourly rate associated with the new work. Our managing partner may now frown and say that this decision results in an increase in income of $33,000 and, while not great, only reduces A3’s hourly bill rate by $3. Can we now please move on to the cost analysis? Leaving aside potential opportunity costs, what happens if the initial 200-hour commitment to insurance defense increases? We point out that based on A3’s current 1,900-hour commitment to litigation and the fact that all other qualified associates are working at capacity, there is a risk that the firm’s revenue stream starts to erode by $40 per hour beginning with hour 301. If the immediate pressure is greater to produce the $165 per hour work and the firm has no response for the $205 per hour work, the $205 per hour work is at risk. Can’t we just hire someone new? Why can’t A3 work more? Why can’t we just spread the production over the remaining qualified timekeepers? It might not happen so can’t we just worry about it when and if it does? The list can go on, but these questions are enough to get the important issues into the discussion. It is also important to remember that the new insurance defense practice will provide 20% of the new firm’s revenues, and will deserve a level of influence commensurate with this contribution. Forcing these issues now will help to ensure that no one is set up to fail, including the new insurance defense group. Our managing partner (MP) is now either embracing this process or he is getting ready to thank and excuse us. In our experience, most managing partners or management committee members consider short-term factors more heavily. Understanding these inclinations, it is very important to ensure that our process moves quickly. For now, assume we have the MP’s attention and he wants to see more. Moving forward, we turn our attention to an often overlooked stakeholder in this type of decision. Let’s review more precisely what is happening to A3’s revenue stream, which has significant relevance to A3’s compensation and career development. A3’s workload recap is presented again below. One the upside, A3 has an immediate opportunity to increase timekeeper collections by $33,000, which may result in a bonus or bonus increase. For example, if A3 is awarded a bonus of $50 per hour (example and not a recommendation of any bonus plan) for all hours more than 1,900 annually, this new work will result in an immediate $10,000 (200*50) financial reward. A3 also has the potential for an additional $5,000 (100*50) reward at full capacity to A3. Probably attractive in the short run. A3 is likely happy, but now the firm has reduced its return on these incremental hours by +- $11,500 (10,000 bonus *.15 benefits). We mention this here because it is relevant to the future profitability analysis. Let’s play out the scenario contemplated by our question regarding insurance defense growth. If A3’s 1,900 general litigation hours are considered stable source of billings and A3’s billable capacity is 2200 hours, returns begin their ascent at 300 insurance defense hours. Consider the following diminishing returns analysis. This first table presents a schedule of billable hours assuming and increase in insurance defense and a decrease in general litigation. 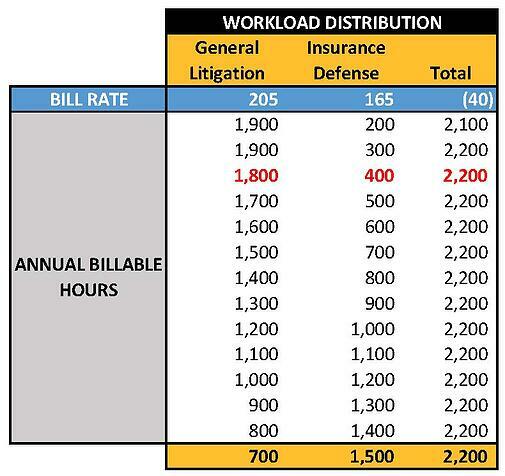 Assuming the firm is faithful to its capacity standards, annual billable hours capacity will remain at 2,200 for A3. We have decided to test the following workload scenarios. 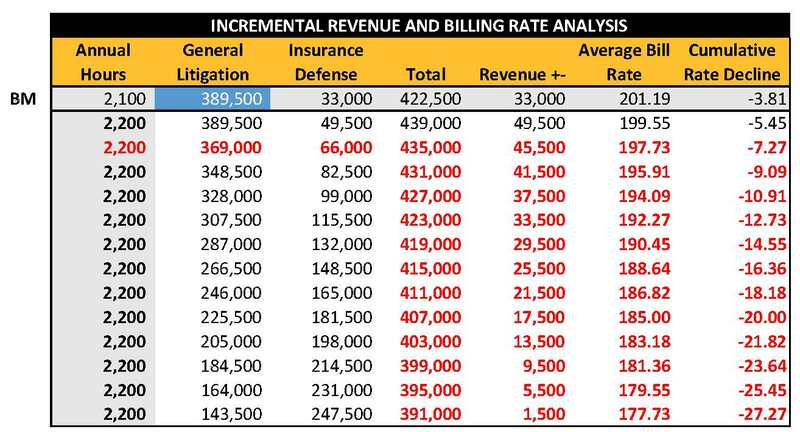 The analysis below indicates the effect on revenue and billing rate, and also identifies the point at which all income gains evaporate. Should A3 go entirely into insurance defense and start building a leveraged team? Can A3 back out of insurance defense without hurting P4’s practice? If the general litigation section replaces any lost production from A3, where does that leave A3? Will clients allow for the addition of new timekeepers into the staffing mix? Will A3’s litigation skills fall behind other general litigation associates? Can A4 eventually become a resource for insurance defense? Can and should A3 decline this opportunity? If this were to occur, A3 would likely wonder how she ended up in this spot. A3 should also have the opportunity to discuss any of her concerns with the firm’s managing partner. Adequate forethought and honest communication will improve the decision-making process and minimize any unintended consequences. We often encounter this type of situation when working with clients. Typically, this occurs when a firm secures a large case or lands a new client. Temporary or partial commitments can become long term and expand. It is for these reasons that we recommend that our clients broaden the workload analysis to understand the point at which incremental revenues evaporate and the effects become detrimental to the firm and the lawyer. Beyond the potential for eroding profits, we recommend considering the impact of A3’s split workload on the capacity of the General Litigation Section. As indicated in the following table, the General Litigation section, when taken as a whole, is essentially operating at capacity. Looking at the individual capacity of each timekeeper in the General Litigation section, it indicates that Partner 1 is working beyond peak and that A3 has time to contribute. Assuming it is possible, a healthier workload distribution would shift work to A3 from either A1 or P1. It is typical to encounter this type of situation when analyzing workload distribution and often it is the result of a skill set mismatch or a delegation issue at the partner level. Skillset mismatches occur when the client work requires a higher level of experience than the attorneys with available capacity can offer. Delegation issues can happen for many reasons, but the two most common relate to compensation disincentives and client control issues. Regardless of the reason, our sample firm should consider the wisdom of splitting A3’s focus and the potential unintended consequences. Filling available capacity can produce a short term profit and can provide intangible benefits such as courtroom experience, but reshuffling some of A1’s workload to A3 and P1’s work to A1 may produce a better long term result. If this is the decision, then the cost of a new associate to support the Insurance Defense section is now a cost consideration in our lateral analysis. Is it better to use A3’s available capacity in the short run or is it better to hire a new associate in advance of full demand? Eventually, A3 must allocate more time to marketing, leveraging and training. What is the plan for adding future capacity? How feasible is it to redistribute some P1’s work (General Litigation head)? Can the firm overcome the obstacles to a better workload distribution in the General Litigation Section? What is the likelihood that the insurance defense section will continue to grow? If the possibility of growth is minimal, does it make sense to limit insurance defense supply (hours) at capacity? Should the firm consider restricting the growth of insurance defense? What are the opportunities to grow the other, more lucrative, sections? Will the firm implement two salary and or bonus structures? What are the partnership considerations for the associates? 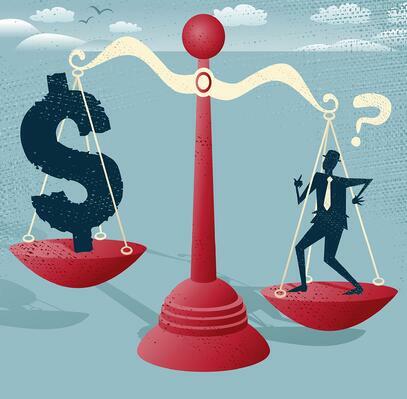 Can the firm’s compensation system account for differences in profit contributions or will the addition of this lateral group necessitate a change in the existing plan? Taking a strategic pause can result in clearer expectations and an easier assimilation of the new group into the firm. 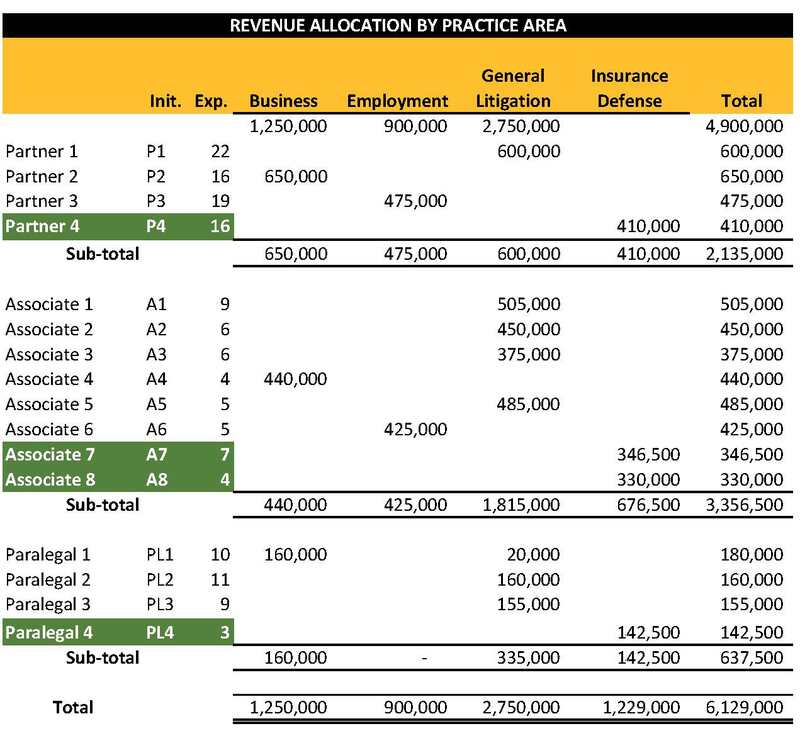 A proper vetting process coupled with an analysis of practice area trajectory, attorney capability, billable capacity, profitability, post lateral compensation, applicable equity, and cash flow can significantly improve the attrition rate among lateral hires. CLICK HERE TO READ MORE ARTICLES ON ESTABLISHING AN EFFECTIVE LATERAL HIRING PROCESS AT YOUR LAW FIRM.